The Vietnam War saw the first practical use of dedicated grenade launchers versus the rifle grenades of WWII and Korea. 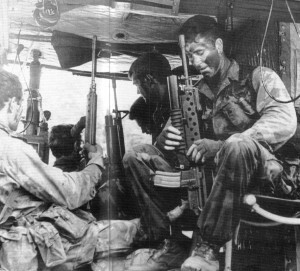 The M79 Grenade Launcher was revolutionary. It was light weight, accurate and had a range of up to 300 meters, well beyond the range a man can throw a hand grenade. The inherent problem with the system was that your Grenadier was a dedicated grenadier and not a rifleman as well. Grenadiers were issued a sidearm as well for personal defense but the quest to combine a rifle with a grenade launcher was born. In an attempt to solve this problem, several designs were submitted, but the most widely used and recognized development was by Colt Firearms and their XM148 Grenade Launcher. The Colt XM148 mounted under the barrel of an M-16 rifle, allowing an infantryman to have both a primary weapon and a grenade launcher. 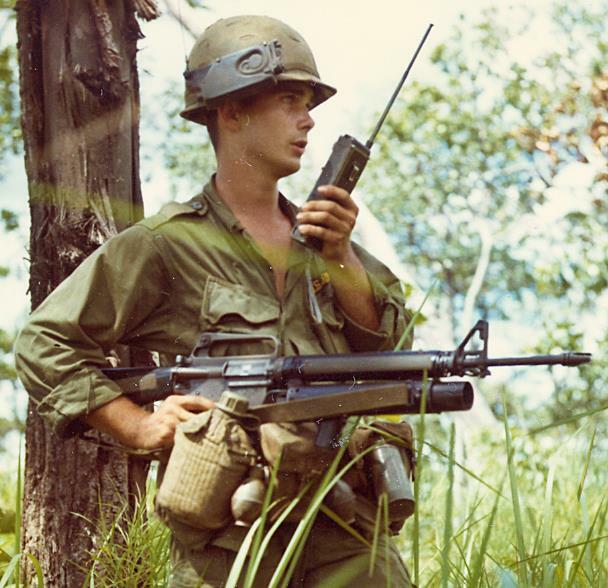 The first successful prototype grenade launcher for under barrel mounting was the Colt CGL-4. The CGL-4 was manufactured by Colt on an extremely limited basis. They made 30 total launchers based on a March 1965 contract. The launcher is very similar to the XM148 in appearance with the primary visual difference being a a round cocking knob at the rear of the receiver. 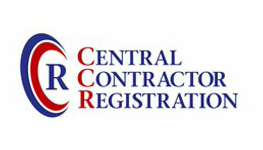 Failures in the extractor and allow for the housing plagued the initial trials at Aberdeen and Fort Benning and a short list of quick improvements was given to Colt. (An interesting side note is that despite the failures of the CGL-4 in stateside testing, units did make it to Vietnam and can be seen in photos. The round cocking knob is a dead giveaway in a photo). The changes to the CGL-4 were combined into the Colt XM148 and test production started immediately. There were some issues with the sights working loose and castings cracking. It took months to correct these basic problems and no real attention was paid to the basic functional issues. With the basic durability issues corrected, the first shipment of 1764 launchers and spare parts was sent to Vietnam in December 1966 with the rest of the contract following in the next three months. Most of the XM148’s issues were simply a result of a rushed design process. The launcher’s designer, Karl Lewis, claimed to only have taken 47 days to write the specifications, design the launcher, draw all original prints, and build a working model. Without time to conduct proper field trials and testing, the issues with the launcher had to be learned in combat. Some of the XM148’s more dangerous and frustrating issues stemmed from the basic design. The sight was a very primitive quadrant sight, that was mounted off to the side. The lack of accuracy and off positioning of the sight meant most soldiers operated without it. Another major flaw was in operation of the launcher. The XM148 had a cocking handle and an extended trigger that allowed the weapon to be fired without removing the users hand from the rifle’s pistol grip. In theory, this was an excellent idea, but in reality the extended trigger was extremely fragile and prone to snagging or breaking. The trigger pull was also fairly light at six pounds on average and resulted in accidental discharges when the trigger was snagged. Initial combat reports from Vietnam were positive, but they would be short lived as major issues began to appear by March of 1967. By May 0f 1967 it was recommended that the launcher be withdrawn from use in Vietnam. Despite this order, the launcher would continue to see use in combat with infantry units as well as Special Forces. The SEALS would continue to use it up through the early 1970’s. 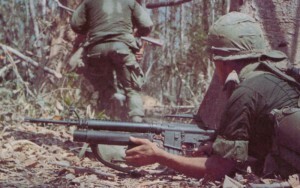 Colt had their foot in the door with the XM148, but the issues with the launcher kept the hunt open for a replacement. Colt had already lost manufacturing contracts on the M-16 rifles to H&R and GM Hydromatic, and did not want to lose the contracts for a new under barrel launcher. The need for a robust and reliable under-mounted launcher was great and the recommendation to remove the XM148 from combat in 1967 created panic in the company. The XM148 had proved the concept viable, it had just failed in application. Colt quickly created a revised prototype, the CGL-5, to address the problems relating to the XM148 Launcher. They delivered 20 units to the Army free of charge in 1968, but it was too late. A new design from AAI Corporation (formerly Aircraft Armaments Inc.) had a solid lead in the testing department and seemed to address all of the issues of the Colt launchers. The AAI design was designated as the XM203 and an order for the initial 600 units was placed to be delivered to Vietnam for further evaluation. Production started in 1969 and the XM203 launchers would be delivered to Vietnam later that same year. With successful field testing completed, production was increased and the launcher was classified as standard. The “X” designation was dropped and the name changed to M203. Though Colt would lose out on the design process for the M203, they did benefit from their large scale manufacturing ability. AAI Corporation made the first 600 XM203 launchers and then completed approximately 10,000 M203 units, but as a research and development company, they were not equipped for mass production on a scale the armed forces required. As a result, the technical data package for the M203 was sent to Colt and they were awarded contracts for mass production. In the end, the M203 would still wear Colt’s prancing pony.